When Harold Wu moved from Toronto to Baltimore for a new job, the first thing on his to-do list was to get a place to live. As he embarked on his apartment search, the T Rowe Price senior vice president of procurement decided to book a hotel in Baltimore for a week in September. WhyHotel operates temporary hotels within multifamily buildings during a lease-up phase of a new apartment building. Wu liked the idea of having a place with a full kitchen for the week as a home base. He never thought he’d actually end up living in that very apartment complex. His weeklong experience at 225 Calvert ended up being the ultimate try-before-you-buy. As he looked around at other apartments — he shopped 36 in total — he found himself appreciating his temporary digs more and more. He liked the amenities, the closet space, the lockers for packages and the security. The ultimate test was of the soundproofing, and it passed. The short-term stay aspect of the property made him nervous at first. But he has embraced it. He ended up signing a lease for a one-bedroom instead of two — he no longer has to host guests, as he has a hotel directly in his building now. Other than seeing people with luggage around the elevator banks, Wu said he barely notices his short-term neighbors. Other apartment dwellers haven’t reported the same experiences, citing disturbances and crowded amenity spaces with the temporary guests. 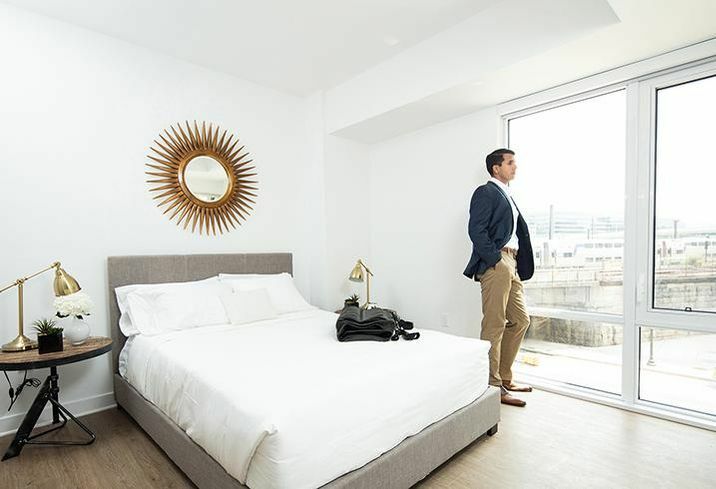 Short-term rentals may not be widely accepted as a viable long-term option for a multifamily owner. Subleasing is generally not accepted, and short-term visitors can be disruptive to residents and create potential liability issues, market experts say.